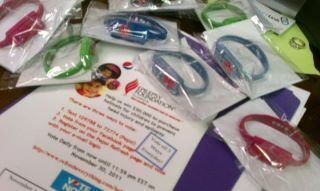 Thanks to our Pepsi Refresh Grant, we were able to deliver 410 USB medical alert bracelets to the Epilepsy Foundation of Florida to be passed out to their clients in need. We were very happy to provide this service to the people of Florida with epilepsy. We will deliver another 400~ around February or March. I live in Alabama, those look awesome. Is there anywhere I can get one since I don't live in Fla.? I have Benign Rolandic Epilepsy. Choose from a variety of I Wear Purple ... Daughter/Son products. Profits benefit Angels4Epilepsy!